The Quilliam sisters Quill and Meg are glad to escape Hemlock Falls' snow and cold weather with a trip to tropical Palm Beach, sponsored by a rich divorcee for her new "charity". Meg hopes to earn a chef's "third star" at the charity's Institute for Fine Foods, and Quill will teach a management seminar. The sisters soon learn they are caught in the middle of a war between the the charity's spiteful sponsor and her enraged, immensely powerful ex-husband. As the fighting surrounding this "charity" for rich divorcees escalates, Quill and Meg become embroiled in sinister feuds and murder. The sisters set out to find the killer in this sunny Florida setting that seems like paradise . . . but where smiles can be as artificial as the facelifts of the charity's youth-conscious attendees. Recipe for Omelet Suzette included. "Always a great reading experience." "Offbeat … intriguing … The reader can settle in Hemlock Falls comfortably." "Fine local color and interesting characters." 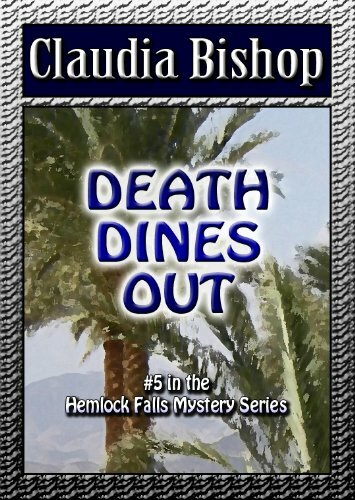 "Claudia Bishop writes an enthralling amateur-sleuth mystery." "An entertaining, quirky, and offbeat mystery … A special treat for amateur sleuth lovers." "Engaging and charismatic … a breath of fresh air." “Stanton writes with a sure hand." Claudia Bishop (Mary Stanton) writes the popular Hemlock Falls mysteries from her farm in upstate New York, where she is surrounded by great vineyards, wonderful restaurants, and the incredible beauty of the Finger Lakes. In the cold winter months, she lives in a small house in West Palm Beach, Florida. She can be reached at her website, www.claudiabishop.com.